1,8-cineole, a compound found in Eucalyptus, peppermint, and rosemary (and possibly others, these are the ones I’ve heard of though), is referenced by some bloggers to cause slow breathing and possibly even stop breathing in infants. Scary stuff! The last thing we want to do is cause respiratory problems by using essential oils. The goal with essential oils is to promote wellness, and use them to solve health problems that aren’t caused by a needed diet change or unhealthy lifestyles. Essential oils can be a powerful healing tool, but they also are a very very concentrated part of the plant. Anything in a high concentration is more likely to cause problems, at the same time, the high concentration is what makes these effective medicines. Before I listen to any claims on ‘oh, it’s safe, I’ve always used it for my children’ or ‘no, it’s absolutely not safe because it contains 1,8-cineole’ I want to look for actual studies, and make an educated decision off of that. More leeway can be given to things that have been used for hundreds or thousands of years, I believe, because there has been more time for issues to surface and be warned about. But I’m willing to bet that 100 years ago Grandma wasn’t using a diffuser to diffuse a bottle of concentrated oil into the air for her infants to breathe. She was, however, giving her children cod liver oil- I can get behind that, for sure. When we’re looking at 1,8-cineole the issue isn’t the purity – this is a naturally occurring substance within the plants that the oils are derived from. The substance itself is the problem. Just like caffeine is naturally found in tea and coffee, even a very pure extract of green tea with no additives will still contain a bunch of caffeine. That doesn’t mean that it’s a good thing to give to our children. 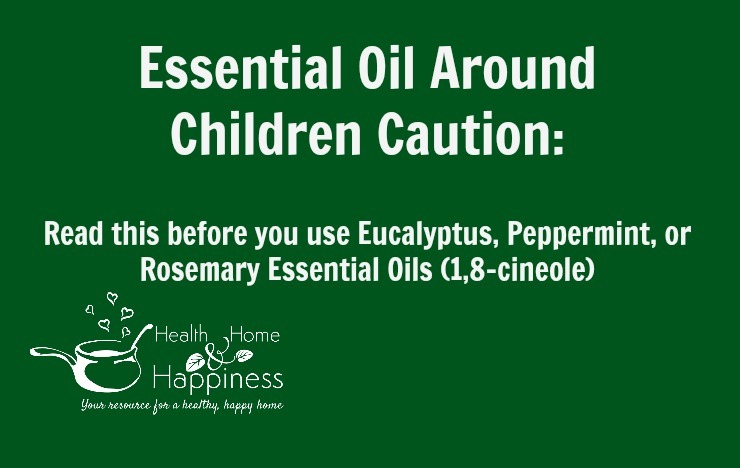 I was first told about the dangers of eucalyptus oil with children in the group Using Essential Oils Safety, see this article. I wanted to do more research and read some studies, rather than just rely on ‘this person said it’s safe’ or ‘that person said it’s dangerous’. A web search of 1,8-cineole reveals lots of documented studies. The compound is said to be found mostly in eucalyptus, but also in peppermint, ginger, basil, rosemary, sage, and cardamon (source). It has shown to be effective at reducing inflammation in the lungs (source), helping therapeutically with asthma (source), bronchitis (source) and helping with a sinusitis (source). See? Essential oils are a great thing to have in your medicine cabinet, but they also are *medicinal* and not to be used without consideration. This article talks about how lethal dose (orally) of eucalyptus oil in mice produced similar symptoms of an overdose of topical eucalyptus oil in a 6-year-old girl being treated for hives (source) with a topical preparation. To put the above study in perspective, 1/4 teaspoon is one mL, so that’s not an insignificant amount of oil, but the symptoms are severe and alarming, and not something I’m comfortable with messing around with. 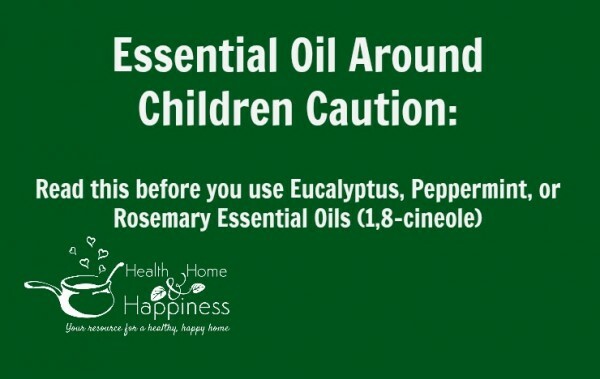 Some of the blends have eucalyptus in them, and where I have used them in the past with my kids, I will now skip eucalyptus in the diffuser around the baby, unless we are hanging onto a cold or cough even with the use of alternative oils, and could use the documented medicinal qualities of eucalyptus. 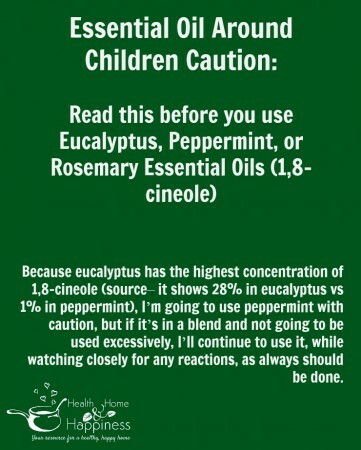 Because eucalyptus has the highest concentration of 1,8-cineole (source– it shows 28% in eucalyptus vs 1% in peppermint), I’m going to use peppermint with caution, but if it’s in a blend and not going to be used excessively, I’ll continue to use it, while watching closely for any reactions, as always should be done. Thank you! I didn’t know you had a baby so here’s belated congrats! Great post and very important information. I wanted to comment and hope it goes through as I have tried commenting before and don’t think my comment went through. Most aromatherapists do not recommend using any type of eucalyptus with children under 1 year. However some allow the use of eucalyptus radiata after 6 months due to the oil containing a slightly lower cineole component. When preparing any EO blend, dilution according to age, body weight and organ maturity is key as this will avoid injury of children and adults. In our home I have always used a very low blend of EO”s for kids under 1 year. Usually about 1-3 drops of EO per 1 ounce (30ml) of carrier oil. I base it on their condition too. Is it an acute or chronic issue? Often I have heard moms say they just toss a few drops of this or than into some oil for their kids. This thinking is dangerous and could severely injure a child. Working with EO’s is not rocket science but it does require study and consulting with a master herbalist or responsible aromatherapist who will be able to give appropriate rates of dilution etc.. This list was recommended to me many years ago by a local aromatherapist. Thanks for commenting :) Great information! I do try to avoid telling moms they have to work with a ‘certified’ anyone before they can use natural treatments – I just want to warn them that they need to consider the dangers of everything – from Tylenol to essential oils to vitamin supplements to colic medicine. The danger of telling moms that they have to consult with a certified aromatherapist, I think, is that that can be quite costly, and a low income mom might just decide to use Tylenol brand, which is available to use without a doctor’s visit. Some internet research with a healthy dose of common sense should be sufficient. I had an anaphylactic seizure consuming 1 or 2 capsules of GNC’s Golden Seal with Cayenne. I washed then down with a small amount of yogurt. Next think I knew I was sitting at the kitchen table unable to breathe, hold the phone or my head up. I called 911 and they gave me a shot and took me to the ER. Thank you so much for this post! I have bee using YL for about six months. I have a newborn and really appreciate this timely info! Natalie, ME too! I just ordered some of the calming blend. Each of our kids have a diffuser in their rooms. I am excited to try the KidsSafe Line! Interesting! I’d never heard this about those oils. My 6 yr. old has a cough, and just yesterday I made up some GOOT with coconut oil, olive oil, and garlic, and I added a couple drops each of lavender and eucalyptus. I’ve put it on her feet and chest a few times and it really seems to be helping. Maybe I should try lemon oil with the lavender instead. I’ve always thought eucalyptus was THE oil for coughs (isn’t it in vicks rubs?) but maybe I should hold off for my kids. So what do you use for your kids coughs? I’ve been using the garlic salve, and giving elderberry syrup. Any other ideas for getting rid of congestion/coughs? I don’t want to use OTC meds, and various “natural” or homeopathic syrups I’ve bought before never seemed help. Thanks for commenting! :) Great questions. I will use on Guard, which has eucalyptus in it, for my older kids (they share a room, I actually have some on gaurd diffusing in their room as I type and they sleep! The baby hasn’t had a cough before, if he did, I think I would use eucalyptus if the other oils didn’t work. I think it has its place, people might just want to be cautious about using it as a preventative measure during the cold and flu season. Hope that helps! i have read that fir needle is good for congestion and its kid safe. I get a lot of my information on oil safety from essentialism logging.com. It is run by plant therapy but I have found their information to be accurate, unbiased, safe, and very much more conservative than a lot of other blogs on oils. They have a certified aromatherapist that writes it and she is very helpful. Also, you can do a search on the blog and pull up a handy chart they have with all of the kid safe oils listed and their usage. The is based on Robert tisserand’s suggestions. What can you do for a baby with wet-sounding breathing? (sm 1 month old) Can you put Oil of Oregano on his feet? I have 70% cavrocol Oil of Oreganol. Pretty strong. Have never put anything in a vaporizer. It’s true that there are so many types of essential oils out there for various purposes. And one of essential things is to have clear knowledge with clear analysis before using oils. I also have known that rosemary is not good at some cases and lavender is one of popular and safe oils people can use for their family. Thank you! thanks so much for these valuable information, I have been using lavender and oregano for a long time in the diffusers of my room and my child’s room, I will be extra careful from now on regarding the EOs and the brands selling them. Hi, Great article, Cara! Question for you: what would you recommend for pregnant women with sinusitis? Do you have any research I could read on that? We use Peppermint and Tea Tree Oil shampoo for kids under 5 (as young as 2). We use it as a preventative for lice (tea tree oil). The peppermint is below .5% concentration. Is that considered safe? So what is it that Vicks Vapor Rub has in it? Just camphor? I always thought it had Eucalyptus? Anyway, I like Eucalyptus because of my Vicks memories as a sick kid, just that my Mom would always apply it when I was sick, and it was comforting. Vicks actually redesigned their product a few years ago after concerns regarding the effect of menthol on children — the original Vicks VapORub states it is not for use on children under two years of age. Vicks BabyRub, which is safe for three months and up, does not contain menthol (ie. Peppermint oil) or camphor. OMG…. stop breathing, how come it’s so serious… Recently, there are some cautions about harmful sides of the essential oil. The lastest I’ve just read is that it can cause migraines and headaches, but breathing problem is more scary! Thank you so much for sharing! We have to pay more attention on using essential oil rightly and harmlessly.